Italian Doll Convention 2018 day one: my first ever doll convention! I’ve finally attended my first ever doll convention! as you’ve probably read in a previous post, I took the plunge last year and registered for the 2018 Italian Doll Convention, and boy did I make the right decision! The experience was a blast and so I’m going to present the whole event here in the blog, with lots of photos and information. We will begin with Friday, 18th Of May, the first day of the convention, which was dedicated to Poppy Parker! I arrived at Bergamo airport at 11:00 am Friday (Rayan Air helped to keep the budget low) and popped over to Milan with a bus. Checked in at my hotel near Milano Centrale FS - not staying at the convention hotel was not the most convenient option but it was definitely the cheapest. Being familiar with the city, since it was not my first time there, I then took the Metro (underground train) to the convention hotel, to get registered, managing to arrive a few minutes after it had begun. One of the amazing Magia2000 guys was at the registration, the lovely Mario Paglino, along with assistants gorgeous Sebastiano Zaffalon and the incredible Ibrahim Ismail, who registered me and walked me through the do’s and dont’s of my first convention. I received the convention bag, full of goodies and all necessary stuff for the next three days, plus my convention bracelets, to be worn proudly for the duration of my stay, while nixing every chance of flirting with gorgeous chic Italians in the wider Milan metropolitan area! Registration queue - being early means no waiting time. Mario is in the middle, Sebastian with the darker pink shirt and Ibrahim with the black one. Finishing early with the registration meant I had quite some time until the start of the first day event, which was at 20:00. So I decided to visit the Armani Silos building near via Tortona, in one of the most fashionable districts of the city, near the lovely canals, I navigli. On one side of via Bergognone are the Silos and right across you can see the company’s headquarters and the Armani Teatro, where the runway shows of the famous designer take place. A pilgrimage for every serious fashionista indeed! The Armani Silos turned out to be quite the experience! The ground floor, apart from the reception, cafe (more later) and guardarobe, have a temporary exhibition space, these days dedicated to the photographer artist Paolo Ventura. His work is characterised by the short stories he makes by constructing small scale dioramas and photographing them, creating his own worlds. Photographs, models and paper dioramas combined into a great experience, which was the icing on the cake that was Armani Silos. The rest of the edifice is dedicated to the master. Three floors brimming with his clothes, divided by floor into three categories/themes: androgynous, ethnic and stars. Androgynous is about the brilliant way he fuses masculine and feminine in his clothes, his most prominent charachterisic along with his fluid tailoring. Ethnic is about the way he incorporates influences and elements of other cultures without merely copying them. And, finally, stars, was about his scintillating evening wear, minimal yet opulent, in a way only Armani can do. One of the great things about this exhibition is that you can walk amongst the clothes, able to look up close to all the details and workmanship involved. The only fault (for me) was the lack of detailed information on the outfits: apart from the respective collection the outfit comes from, no other information was given. Half of the third floor is taken over by the brand’s digital archive, accessible through huge touch screens and iMac computers. There is also a small screening room, where films and ads made for the house are shown - when I was there, a film by David Lunch was being projected. I had to have a coffee at the ground floor cafe, both to relax and absorb what I had just seen, but also to charge my phone. The experience kept on being full Armani, with branded water and even sugar cubes and chocolate! There’s a lovely outdoors space too. I left to have lunch at the big canal, Grande Naviglio, at a favourite osteria, but had to hurry back to the Silos afterwards, as I had forgotten my convention bag at their guardarobe! After that, back to the hotel to freshen up. Below you can see the contents of the convention bag - best gift in my opinion: the amazing Balmain pencils! Thank you Magia 2000! Best of the bunch: Balmain pencils! Time had come for the first event of the convention: the Harajuku party dedicated to Poppy Parker and the special guest from Integrity Toys, the designer David Buttry! A big ballroom was transformed by cartoon balloons, lighting and decorations into a harajuku scene, with many attendees dressed up as manga and anime characters or merely following harajuku style. A lavish buffet took over half the room, with lots of food and drinks available. A DJ was there to enhance the effect, later helping attendees burst into karaoke performances with the Spanish contingent making the biggest impression! Meeting people that until then were only known to me through doll groups or social media turned out to be the best part of the convention, with first and foremost the lovely, kind and talented David Buttry. Me with lovely David! It was great meeting him at last! David Buttry made his appearance on stage to give an interview to Rogier Corbeau, from the great blog Dutch Fashion Doll World. I found out that the questions, submitted by readers of the blog, were screened by Integrity Toys beforehand, which is kind of weird. The interview itself was great, with David telling us about his work process, his inspiration sources and how Poppy came to be. He also told us that the exclusive convention Poppy begun her life as part of the Swinging London Collection but was kept out of it to then transform into the event doll. He had also brought along another Poppy, a prototype doll from the Swinging London Collection that was part of the exhibition of various Poppy Parker dolls (all from the collection of Lauretta Tonini) at the event. Another exhibition inside the ballroom were the brilliant photographs taken by José Rdriguez (Ken Mad) with Poppy at the Scala of Milan as theme. Each photograph had Poppy transformed into an opera heroine, from Tosca to Norma to Aida. We were extremely lucky to each receive a lovely box with the printed photographs. Ciao, Poppy! was the gorgeous event doll, finally revealed to us with a special presentation, and given to all attendees upon the presentation of the corresponding ticket received upon registration. The exclusive doll, limited to 250 pieces, even less than a centerpiece in other conventions, dressed in colourful clothes, with pink hair, a flower necklace in multicoloured stones, short skirt, knee socks, high heeled peep toe pumps and a shopping bag with her face and the words Ciao, Poppy! on them. She has the high heel feet instead of the classic Poppy articulated feet and her make up is more modern, matching her harajuku style perfectly. My convention Ciao, Poppy! doll. Everyone was so happy to get this special doll, but there was one more thing: a special gift in the form of a bathing suit designed by David in retro style. But that was not the end of it. Another Poppy doll, the blonde variation of the first one, was available to all attendees for purchase, to be bought the next morning for €160,00. This version was again limited to 250 dolls. Apart from the different hair colour, her lips are pale pink, contrary to the strong red ones of the pink haired version. I did not want a second one but bought it for my dear friend Maria of Habilis Dolls, who could not attend and loved her. The rest of the evening was full of fun, drinks, song, dance and friends. The prototype Poppy Parker was raffled off to attendees, and the lucky winner was Lamanda Rae Scott! You can see her below with David and the OOAK Poppy! It was a wonderful evening, being with great friends and getting lovely dolls - what a great way to start a convention! As I got on the Metro train to return to my hotel, I felt happy and excited for the next day. Read all about it in the next post. The W Club 2018 registration period is now open! It’s that time of the year again, when W Club opens up its doors for registration. 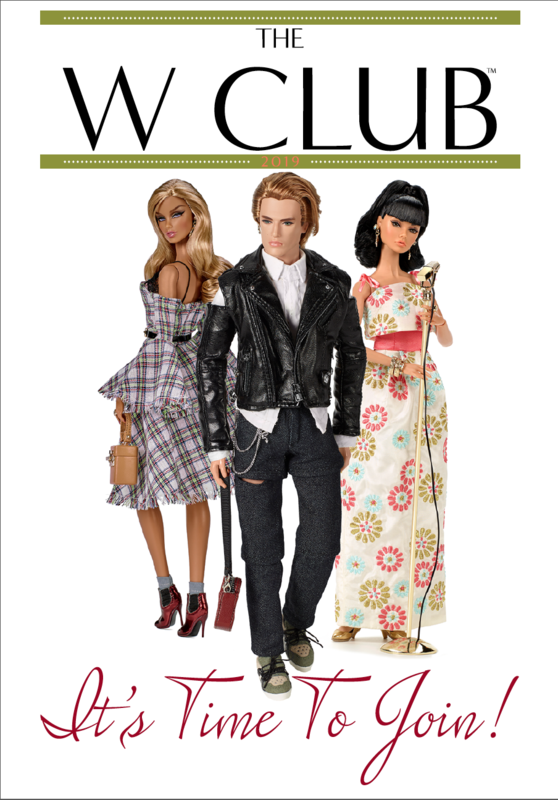 The W Club is the Official Collectors’ Club for all Integrity Toys collectible dolls, including Fashion Royalty®, NU. Face™, Poppy Parker™, East 59th™ and much more. The club year ahead will be packed with exclusive perks, new dolls, special offers, priority service and more. A brochure has been designed to introduce you to all that the W Club has to offer, but should you have questions at any time, please contact the Club Liaisons at wclub@integritytoys.com. The W Club is an online based club and requires online registration plus a valid email address to receive information and special offers. First-to-know information & sneak peeks at upcoming dolls & more. Exclusive access to Members-only forums. VIP customer service from the W Club Liaisons. Club-only opportunities to purchase dolls & more. Priority convention registration and optional access to a Club-only event at Convention. Special offers, Right-to-buy lotteries and contests. Access to private Q&A sessions with the Integrity staff and much more. Important exclusion: Coupons cannot be used to purchase additional W Club memberships. Any memberships bought with coupons will be voided, as the 2018 Club year does not officially begin until after registration ends. Base Membership: $50; Includes the opportunity to purchase at least five exclusive dolls throughout the year- including two exclusive Fashion Royalty dolls (which may include NU. Face), two exclusive Poppy Parker dolls, and one additional exclusive surprise doll- a $25 coupon and a variety of perks, privileges, special opportunities and offers throughout the year. Adding the Upgrade “Modernist” Eugenia Perrin-Frost Fashion Royalty doll (as voted on by 2017 W Club members) to your base membership will have an additional $25 deposit due now and $100 (total of $125 US) plus shipping, handling and tax will be billed approximately in Summer 2018, with the doll scheduled approximately for a Summer 2018 delivery. Adding the “Soda Pop Saturday” Poppy Parker Doll to your base membership will have an additional $25 deposit due now and $100 (total of $125 US) plus shipping, handling and tax will be billed approximately in Summer 2018, with the doll scheduled approximately for a Summer 2018 delivery. Adding the Upgrade “Eye Candy” Rayna Ahmadi Doll from the NU. Face Collection to your base membership will have an additional $25 deposit due now and $100 (total of $125 US) plus shipping, handling and tax will be billed approximately in Summer 2018, with the doll scheduled approximately for a Summer 2018 delivery. Let’s check out the upgrade dolls, starting with Eugenia! Introducing Modernist Eugenia Perrin-Frost, the newest offering from the Fashion Royalty® Collection by Integrity Toys, as chosen by 2017 W Club members, who voted for her features, from her warm and vibrant skin tone (a first for this character!) to her hair colour. Her fashionable ensemble was designed by Jessy Ayala. Eugenia Perrin-Frost is a 12.5-inch articulated vinyl doll with fully rooted hair and hand-applied eyelashes. Her ensemble is composed of a pale blue one-piece dress, accessorized with sky-high metallic blue high-heeled boots, a matching purse, jewelry and sunglasses. Doll stand and certificate of authenticity included. For adult collectors ages 15 and up. 2017 W Club members finally get to see the result of their vote from last year. The doll Is beautiful and elegant, with the right amount of fashion bling to make her a standout. The dress is simple but with an intricate detail at the front. Her accessories are perfect, even though I’d prefer the boots with closed toes. The make up has Going Public vibes (the mouth and general design) combined with Tricks Of The Trade or Spring Forward (eyeshadow) - EDIT: She has the Spectacular screening in different colours. She’s not the smash Vanessa Perrin was when she got the dark skin treatment (Second Skin) but she’s fab. I’m getting her with my membership. UPDATE: Integrity Toys released more close up photos of Eugenia, taken by Jessy Ayala. In 2018, Poppy Parker revisits some of the best looks that she’s worn in her modelling career so far, with a twist. The W Club introduces the first entry in the “City Sweetheart” Collection, as designed by David Buttry. Poppy Parker is a 12-inch fully articulated fashion doll with fully rooted hair and handapplied eyelashes. Dressed for a sunny summer day in New York city, Poppy looks as sweet as ever in her delightful, high-color day dress! She comes complete with a purse, jewelry, shoes, bright pink and bejeweled cat-eye glasses and a bottle of her favorite orange flavored soda pop. Doll stand and certificate of authenticity included. For adult collectors ages 15 and up. I’m not crazy about this year’s upgrade Poppy. The eyes look weird (She has the Reluctant Debutante screening but with applied eyelashes), the hair is blonde (I have too many blonde Poppies), the lipstick too light pink and the dress looks like a variation of the one She’s Arrived had. She has the new high-heeled feet. I love the shoes and the bow details on her bag and bracelet. Easy pass for me. Rayna Ahmadi, the 2018 NU. Face upgrade doll option, marks the debut of the new 2018 collection, as designed by the talented Jessy Ayala of Integrity Toys. Rayna Ahmadi is a 12.5-inch articulated vinyl doll featuring fully rooted hair and handapplied eyelashes. Rayna wears a one-piece denim overall jumpsuit and completes her look with an oversized jewellery set, a colourful bandana, matching denim open-toed high-heels and a unique ice-cream cone shaped purse. Doll stand and certificate of authenticity included. For adult collectors ages 15 and up. This is an amazing Rayna, one of the best ever released. Her face and make up look great, using pink in the right way. She reminds me of the IFDC Rock Me Baby Rayna but enhanced with warm vibrant pink. Her outfit looks amazing - I’m a sucker for late 70s styled jeans. It would have looked even better in a dark blue denim though. Her shoes are awesome, her bag weird and the jewellery good. She’s coming home too. So, are you joining the W Club this year? If so, which upgrade dolls are you getting, if any? So, how do you become part of the W Club? For how long is your 2018 Club membership valid? As a member, will you be guaranteed every exclusive item from the Club? Every member in good standing will be guaranteed the right to purchase at least 5 exclusive dolls, which will be offered at various times throughout the Club year, including the 2 Fashion Royalty exclusive dolls (which may include NU. Face), 2 exclusive Poppy Parker dolls, and 1 additional exclusive doll during 2018. Members that added upgrade dolls during registration are guaranteed those upgrade doll(s), as well. There will be other limited items which will be available by lottery or first-come, first-served opportunities. Please note that membership in the W Club does not guarantee access to Integrity Toys’ non-Club exclusive dolls and accessories. None of the dolls available through the Integrity Toys’ authorised dealers can be purchased through the W Club and are not W Club exclusive items. How many 2018 Club memberships can you purchase? The number of memberships by collector or household is not restricted. However, memberships are non-transferable and cannot be shared. You live outside of the US. May you still become a member? news releases and information will be released in English only. You would like the Club information sent to you via regular mail; can it be done? makes it easier for you to take advantage of the many offers. How about more information about the purchasing of exclusive W Club dolls? 2018 W Club members are guaranteed the right to purchase the exclusive W Club doll(s) from 2018 only (these dolls are separate from and in addition to the upgrade dolls that you can purchase at registration). The number of W Club exclusive doll(s) produced is based on the number of pre-orders paid. If you do not pre-order the Club doll(s) by the designated cut-off date (there is usually about a week-long ordering window), you forfeit your right to purchase that Club doll through the W Club. Also, Club doll(s) from previous years are NOT available to 2018 members- Club dolls are only available during that specific membership year. How about more information about the Club coupon? Each W Club membership that you purchase will automatically add a special $25 coupon to your IT Direct Coupon Wallet that can be used towards ANY IT Direct shopping cart purchase of $99 or more online only during the 2018 W Club year. As long as your order is above $99 before shipping and tax, you can apply your coupon towards any order of your choice. Full details and instructions for the $25 coupon will be sent to 2018 W Club Members at a later date, including that a one coupon limit will be allowed per order. Important exclusion: Coupons cannot be used to purchase additional memberships. officially begin until after registration ends. When will you be able to log into the W Club forum? registrations that are expected to be received at this time, it can take up to a week or more for the welcome notice to be sent out and you should be patient until you are sent the notice. The upgrade dolls will have a non-refundable deposit due immediately, with a balance due at shipping time, approximately in Summer 2018. Prototypes shown, final production may vary slightly. **All photos and information contained herein is copyrighted Integrity Toys, Inc. and Intercap Merchant Partners, LLC 2018 and may not be reprinted or disseminated without express written permission. FASHION ROYALTY, POPPY PARKER, NU. FACE, EAST 59TH, THE INDUSTRY and all other character marks followed by ™ or ® are trademarks of Integrity Toys, Inc. Chesapeake City MD USA 21915. All rights reserved.